This is the date provided on her death certificate. She is, however, listed in the 1870 US federal census, which makes this implausible. It appears that she and her husband are renting half of a double shotgun house owned by their son Frank Baham, who lives in the other half with his wife and son. New Orleans, Louisiana, Death Records Index, 1804-1949 indicates she was 71 years old when she died in 1946, which would put her birth date in 1875. This is the date on her death certificate. However, birth records indicate she was born in 1868. Death certificate witnessed by her son, Mullen N. Baham. mmThe license was issued 26 Jan 1899. The marriage took place 4 February 1899 and was recorded 15 February 1899. This is to Certify, That it appears from the Records of this office, that on this day, to-wit: The «i»Fifteenth of February«/i» in the year of our Lord, one thousand eight hundred and «i»99«/i» and the one hundreth and «i»[? ?«/i»] of the Independence of the United States of America, (Feb 15 1899) was registered a marriage, celebrated in the City of New Orleans, La., by «i»[unclear] F. C. Clark«/i» on the «i»4«/i» day of «i»february«/i» 189«i»9«/i» between «i»Celestin Baham«/i» («i»43«/i» years,) a native of «i»St. Tammany L«/i», son of «i»Pedro Baham«/i» and «i»Virginia Baham«/i» and «i»Josephine Fauria«/i» («i»[?? ]«/i» years,) a native of «i»N O L«/i», daughter of «i»Joseph Fauria«/i» and «i»Rose Fauria«/i». The celebration of marriage was performed in the presence of witnesses «i»Arthur Esteves, M[ichel] Fauria, Vincent Fauria«/i». The License was issued on the 26 day of January 1899 [unclear] in the presence of the witnesses «i»Arthur Esteves, M[ichel] Fauria«/i». The marriage occurred on 4 February 1899 and was recorded on this date. [S18] US-Louisiana-Orleans Parish-New Orleans Birth Records Index 1790-1899, (Ancestry.com Provo, UT, USA: The Generations Network, Inc., 2002. Original data: State of Louisiana, Secretary of State, Division of Archives, Records Management, and History. Vital Records Indices. Baton Rouge, LA. ), Vol 47, Page 83 (Reliability: 1). [S223] Death Certificate, FAURIA, Josephine (d 14 Oct 1946) Louisiana Vital Records Vol 222, page 5529 (Reliability: 3). [S28] Census-US federal-1920, Ancestry.com, (Provo, UT, USA: The Generations Network, Inc., 2005. ), Year: 1920;Census Place: New Orleans Ward 8, Orleans, Louisiana; Roll T625_621; Page: 7A; Enumeration District: 138; Image: 1019. Family of Celestin Baham (Reliability: 3). [S144] Census-US federal-1930, United States Bureau of the Census, Year: 1930; Census Place: New Orleans, Orleans, Louisiana; Roll 806; Page: 43A; Enumeration District: 127; Image: 359.0. Family of Celestin Baham (incorrectly enumerated as Alestin Bahan) (Reliability: 3). [S45] New Orleans Death Records Index 1804-1949, Ancestry.com, (Provo, UT: MyFamily.com, Inc., 2002. ), Fauria, Josephine Page 5519, Vol 222 (Reliability: 3). [S18] US-Louisiana-Orleans Parish-New Orleans Birth Records Index 1790-1899, (Ancestry.com Provo, UT, USA: The Generations Network, Inc., 2002. Original data: State of Louisiana, Secretary of State, Division of Archives, Records Management, and History. Vital Records Indices. Baton Rouge, LA. ), Vol 47, Page 83 (Reliability: 2). 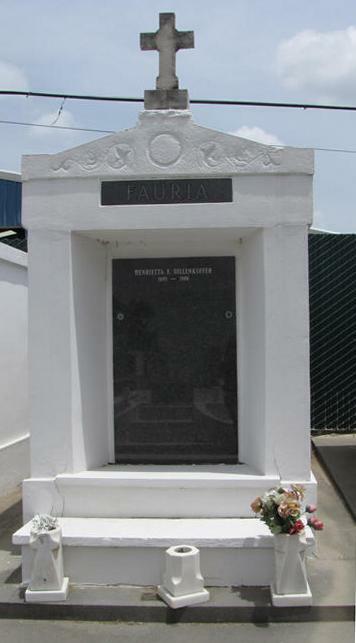 [S334] US-Louisiana-Orleans Parish-New Orleans-St. Louis Cemetery #3 Fauria Tomb ownership records, Saint Louis #3, Fauria, Josephine. Burial 14 Oct 1946, Position V1. (Reliability: 3). [S5] New Orleans Marriage Records Index 1831-1964, (Ancestry.com. New Orleans, Louisiana Marriage Records Index, 1831-1964 [database online]. Provo, UT: MyFamily.com, Inc., 2002. ), Vol 21; Page 210 (Reliability: 1). [S227] Marriage Certificate, Marriage of Celestin Baham and Josephine Fauria, 15 Feb 1899; New Orleans, Orleans, Louisiana, USA. (Digital image) (Reliability: 3).